While looking for astronomy-related things I found out about this Turkish history manuscript from 1583 called the Zubdat al-Tawarikh or "History of the World". 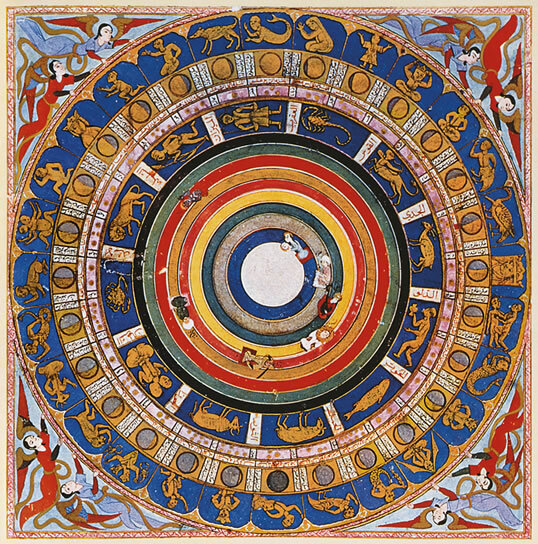 One of the first things in it is an elaborate diagram showing the twelve Greek zodiac constellations and how they align to each of the phases of the moon and 28 associated "lunar mansions" it can be found in. The one that caught my eye was the "fuller" of the two lunar mansions of Capricorn (drawn like a regular goat here), as it looks like some kind of griffin with four bird feet. Compared to all the other humanoid figures that seem to be doing some specific action similar to the way stars were named in Arabic, this felt to me like an odd thing to label a phase of the moon that likely had some kind of small story/symbolism behind it. Unfortunately, I can't seem to find anything about what any of these lunar mansions were named. I could find Arabic names of lunar mansions, where it seems the griffin phase is named for one of the "Saad" stars, but none of them seemed to match up to any of the outer illustrations here. It seems like other pages of the manuscript might not be a lot of help because most of those I could find just seemed to be a big elaborate genealogy tree. The constellation wheel does look like it has labels on it that would be readable with a high-resolution picture, but of course I have zero of the language knowledge required to understand the probably very old dialect. If you somehow know how to read it that's probably where I'd start. Maybe instead of a griffin it's a mother bird with several small birds underneath like plovers do, and the pointy thing sticking out of the breast is a beak? Browse other questions tagged language ottoman-empire 16th-century turkey astronomy or ask your own question. What religion did Mustafa Kemal Atatürk self-identify as following?